The new pit struck and passed through the four ft. seam, the five ft. seam, six ft. seam and the three ft. seam at which seam sinking was terminated at a depth of 360 yards. 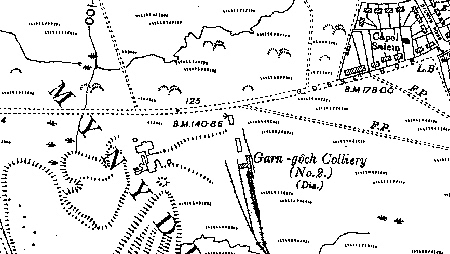 It was one mile north-west of the No.l Pit and worked the Six-Feet seam towards the north and the south until this date.. The No.2 was also managed by J.W. Evans and employed 376 /78 men. No.2 Pit employed 484 men and was managed by W. Morgans. The No.2 employed 439 men and was managed J. Evans. No.2 employed 164/47, manager D.J. Price. The No.2 employed 213 men, manager D.J. Price. It then worked the Five-Feet seam until its closure. the manager being D. J. Price. ? employed 186/75 working the Three-Feet, Six-Feet and Five-Feet seams ? If you have informormation to clear-up this discrepancy, please let me know - Email link at page bottom. 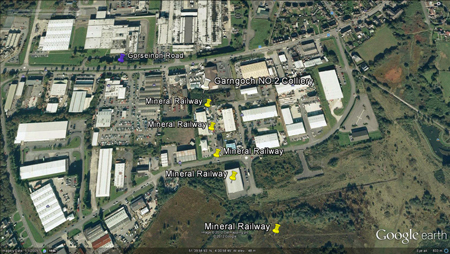 I have purposely left out the position of the colliery shaft on Google Earth, due to its position. "However, the No. 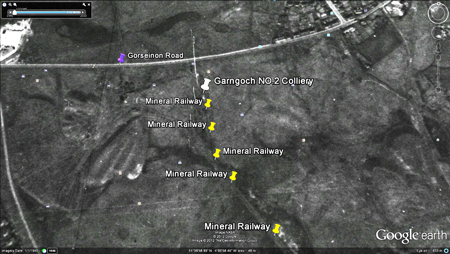 2 Colliery was not closed down but the five ft. seam which was at the lesser depth of 203 yards was opened out. The seam proved of excellent quality and good thickness and the develop-ment of the seam was proceeded with, by which time the coal trade had picked up and the coal from here became known as "Glasbrook's Smokeless Steam Coal." When the workings of the No. 2 Pit met the workings from No. 1 Pit, it was decided to close down the old No. 1 Colliery and raise the coal through No. 2 Colliery."